This tactical folder is overbuilt to last. For those who have a need to use them, this is as much defensive security as you can find in a small tactical folder. The Heiho incorporates CRKT's OutBurst assisted opening mechanism and LAWKS safety system. Features include a stainless steel InterFrame build with stainless steel liners, one locking, and black G10l scales, textured to provide a secure grip. A thumb disk allows rapid opening and the custom Teflon-plated stainless steel clip can be quickly and easily mounted right- or left-handed with a single screw, yielding a knife that is truly ambidextrous. The satin-finished 3.125 in. AUS-8 stainless steel blade is easy to conceal carry. It offers maximum penetrating power in a compact package. 7 in. overall, 4 in. closed. a little on the small side but very nice and sharp. Overall works well. I love the size of this knife for "normal" EDC. I do not care for the difficulty in changing the pocket clip from right-hand carry to left. Kind of a pain in the a**. I am a police officer in Oregon, so I pay for what works, not something I think will work. I also have the CRKT Hissatsu that I had the same pockert clip issue with. They do what I need in a knife. Screw the pocket clip. I fixed it so they both work. Amazing product! Sturdy and extremely sharp... Fast and poweful spring action. 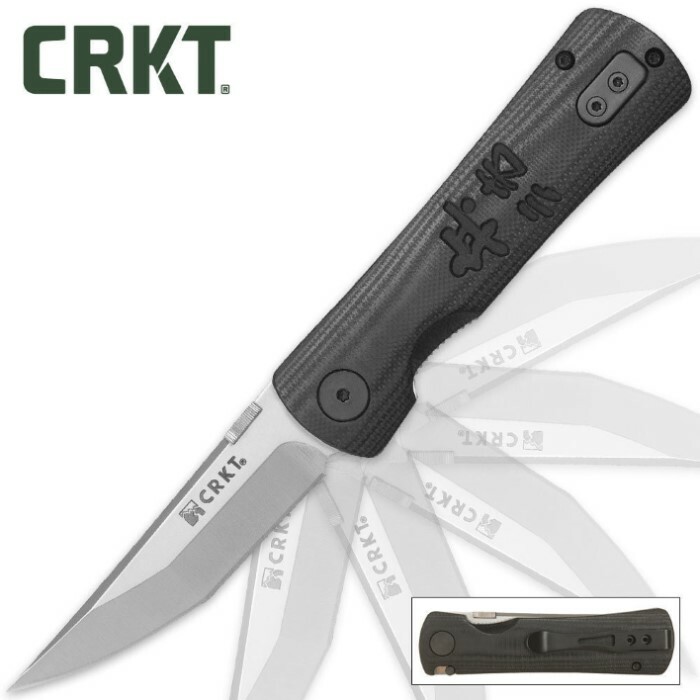 CRKT is a top knotch knive maker and this design is a perfect example of their skills. For the price you cant beat this deal. For anyone considering a more than $8-15 dollar knife, i highly recomend this product. Reason being you can get a great flip or spring action for under $15, but the difference is with this product, it will not break down like the others from wear and tear, infact this knife and others like it will probably outlive you! Haha... Anyway great product i reccomend it to anyone who is looking for a good descrete yet deadly pocket knife. Long time fan of CRKT before they had spring assists. This knife is great. The pros: A nice, subtle feature I noticed is the thumb disk isn't a full circle. My other full circle thumb disks would eventually rotate loose after repeated openings. Razor sharp, shaved my arm hairs effortlessly. The angle of the kissaki near the tip is shallow which gives it great lines and easier penetration. I also like the option of switching the clip. The mechanics feel like butter. The black G10l scales don't seem to be as textured as advertised, but it hasn't slipped out of my hand yet. Think carbon fiber. Actually, the stamped kanji characters provide the most grip. I'm 5'8", 160 lbs so its a great fit in my hand but larger handed folks may dwarf this folder. The opening is a little stiff but like many new things, it needs to be broken in! Would normally rate this 4/5 but for $40 freakin dollars, the price is hard to beat for similar functioning folders. The Hissatsu 2 is a great knife and the little brother to the Hissatsu 1. The knife uses a torsion bar as the assisted mechanism, which I like more than the spring method. The blade comes quite sharp right out the CRKT box. Nearly completely concealable with the deep tip down pocket clip. The G10 handle is polished and not really as grippy as I expected but the deep etched Japanese characters provide some extra grip and it fits really well in your hand. Sleek knife, quality knife, True Swords delivered.